We’re lucky in the Waikato – all kinds of herbs grow year-round in this region. This is a post about some of my favourite fresh herbs and what I do with them. It was inspired by a recent meeting of Hamilton Organic Gardeners. 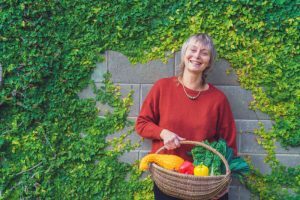 We met in Wendy’s home garden, where she grows an interesting variety of herbs as well as veges and fruit. Some people think dried herbs are easier to use, but most dried herbs (especially the kind you get in supermarkets) don’t have the same taste and aroma as fresh herbs. Herbs also have medicinal uses, but this post is about using herbs in everyday cooking. Growing your own herbs is almost always easier and cheaper than buying them. Buy plants from a garden centre or the farmers’ market, or get a free cutting or root section from a friend or neighbour. Or come to a Hamilton Organic Gardeners (also known as HOGs) meeting, there are usually herb plants on the swap table.The group email is hamiltonorganicgardeners@gmail.com Here’s a link to the HOGs Facebook page. From a gardener’s point of view, herbs have multiple benefits. As well as being delicious and nutritious, herbs are companion plants that attract beneficial insects and discourage pests. 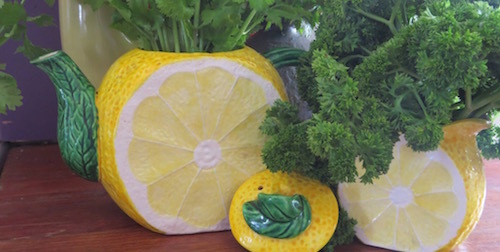 If you don’t have a garden, herbs grow happily in pots. Glorious parsley! All photos in this post are by Dani Edwards. My husband Matthew says he found my parsley consumption a bit weird when he first met me. He’s used to it now. We eat so much parsley that we end up buying it sometimes. David at the Suncakes Gardens stall at the Farmers’ Market sells good parsley, and so do the Southern Fresh Foods people. I only ever use fresh parsley. I think dried parsley is a waste of time. Buy a packet of seeds. Grow lots of seedlings and transplant into the garden. Plant shops generally sell single parsley plants, which is a very expensive way of getting parsley. Also, bigger plants don’t transplant as well. 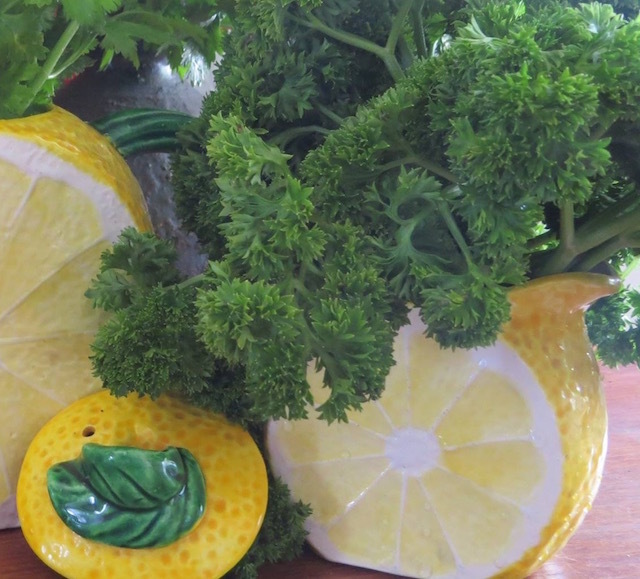 There are curly-leaf and flat leaf (Italian/ Dalmation) varieties of parsley. They look different but are used in similar ways. In the Waikato parsley grows all year round. It grows slower in the winter and tends to bolt to seed in hot dry weather. I save the tiny seeds to grow more seedlings. Sometimes parsley re-seeds itself all over the garden, but sometimes it doesn’t. I usually use parsley raw, apart from in bone broth. Always chop it finely: nobody wants to eat whole sprigs of parsley (not even me!). Add two or three tablespoons of finely chopped parsley to all kinds of salads. Sprinkle a handful of chopped parsley over poached eggs, or an omelette. Add chopped parsley to garlic butter, to spread on sourdough bread etc. 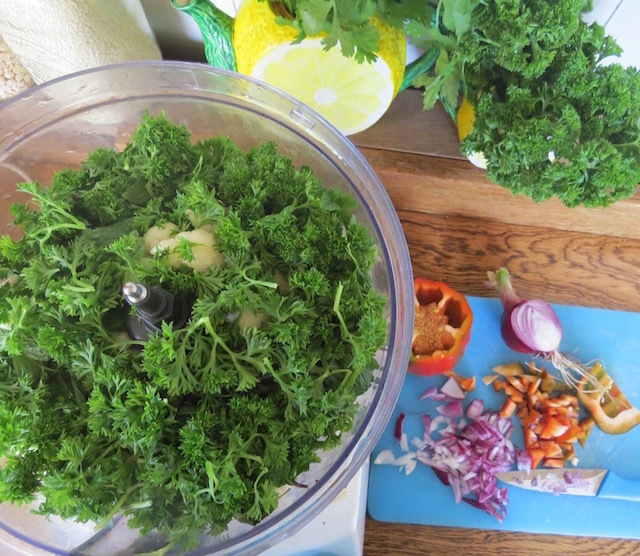 A large handful of parsley (not chopped up) is essential in a bone broth. Here’s a link to a bone broth recipe. Combine parsley with basil, half and half, or use parsley on its own. This wonderful Middle Eastern salad uses huge amounts of parsley and mint. Here’s a link to a recipe. Dani Edwards makes a wheat-free tabbouleh using raw cauliflower as a base. Sage grows easily from a cutting. But if you’re impatient, buy a plant. The kind with grey leaves has the best flavour for cooking. You need a hot sunny dry spot. I had trouble keeping sage alive in the shady back yard, but now it’s happily growing in the sunny front garden. Sage has a really strong flavour and it can be easily overwhelming if you use too much. Just a few leaves is usually plenty. I only use sage in cooked dishes. This is adapted from a Julie Biuso recipe. Rub a free-range chicken with the juice of an orange, then tuck a handful of sage, half the orange peel and two cloves of garlic inside the cavity. Roast the chicken as you usually do. This is adapted from a recipe in Jamie Oliver’s Jamie’s Dinners. He doesn’t brown the meat, which makes the preparation much quicker. I use a slow cooker, which is even easier. I just need to remember to put it on after breakfast. Heat the oil and butter in a frying pan. Add the onion and sage leaves and fry for 3-4 minutes. Put all ingredients into a slow cooker and leave the stew to do its thing for several hours. To finish off before serving, sprinkle over some gremolata (see the rosemary section for this). After parsley, this is my next favourite herb. Rosemary grows easily from cuttings. It likes a hot dry sunny place in the garden, and the bushes can get quite big. Rosemary is very responsive to light, so if you plant it somewhere that doesn’t get full sunlight the plant will keep moving itself around to reach the sun. Which is probably stressful for the plant. There are two main types of rosemary. The upright kind is good for culinary purposes. The prostrate kind is aromatic, but doesn’t have the same flavour. 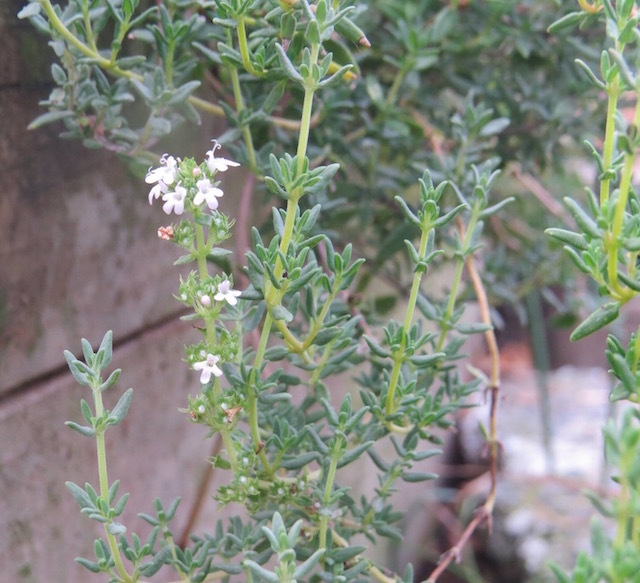 Upright rosemary is the kind to use in cooking. 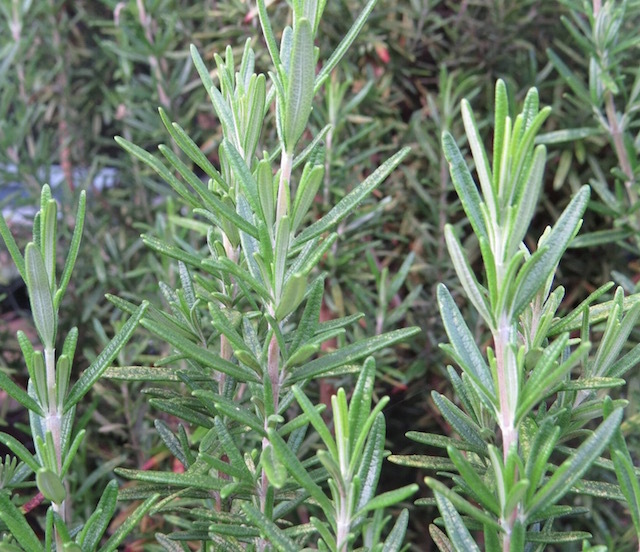 Rosemary differs from sage, in that you can use quite a lot and the flavour won’t be overwhelming. But the leaves are fibrous, so you will either need to chop them very finely, or else make sure people can put aside the rosemary sprigs, rather than eating them. Rosemary has a wonderful affinity for lamb. Sprinkle over the lamb with lemon juice and two or three finely chopped garlic cloves. Leave for an hour, then cook on the barbecue. This adds extra flavour and aroma to beef stew. Try this with Volare ciabatta. You won’t regret it. Combine everything and taste. Add more oil or rosemary if you think it needs it. Thyme grows easily from a piece of root. Garden centres sell many varieties of thyme, most of which are good for cooking, but I just go for the basic kind. Thyme is a synergistic herb that combines with other flavours. Thyme is (I think) more subtle than sage or rosemary. Fresh thyme is an “x-factor” herb that complements other herbs and ingredients to balance the flavour and aroma of European-style slow food, such as a bone broth or stew. The leaves are tiny, so you don’t need to chop them, but they do need to be stripped off the woody stems. See the parsley section for a link to a recipe. take a handful of thyme sprigs and strip the leaves off the stems. Or, just add the sprigs, stems and all to the sauce, and pick them out before serving. Sprinkle thyme leaves (stripped off the stems) over the top of pizza before baking.